Is your Sales presentation missing the “wow” factor? We’ve got you covered. 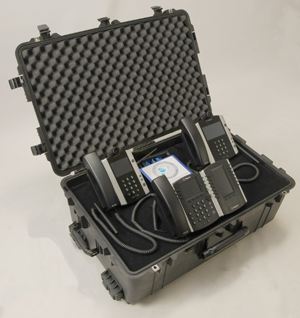 Our custom built Demo Case is your key to increasing your close ratio, converting more “Maybes” to “Yeses.” Simply roll the case onsite, plug in the power and Ethernet cords, and you’re ready to knock the socks off your prospects. Let them make sample calls to experience what it would be like to have VirtualTone as their communication service through you, their trusted technology advisor. Your close rate is guaranteed to increase with this case at your disposal. Every time VirtualTone has taken a case onsite to meet with a prospect, we’ve walked away with a signed order, typically with higher end VVX phones included. But don’t just take it from us; our Partners who are using the Demo Case have seen a significant increase in their close rate and overall deal size. We’re so confident you’ll increase your close rate and average deal size with our Demo Case included in your sales presentation we're willing to reward you for your efforts. With every new client you onboard to VirtualTone, we'll give you the $199 setup fee as a one-time commission. It's that simple. So, what do you have to lose other than your next deal? Make an investment into your future of higher profits. Give us a call to discuss how you can diversify your service offering with VirtualTone by becoming a Certified Partner today!